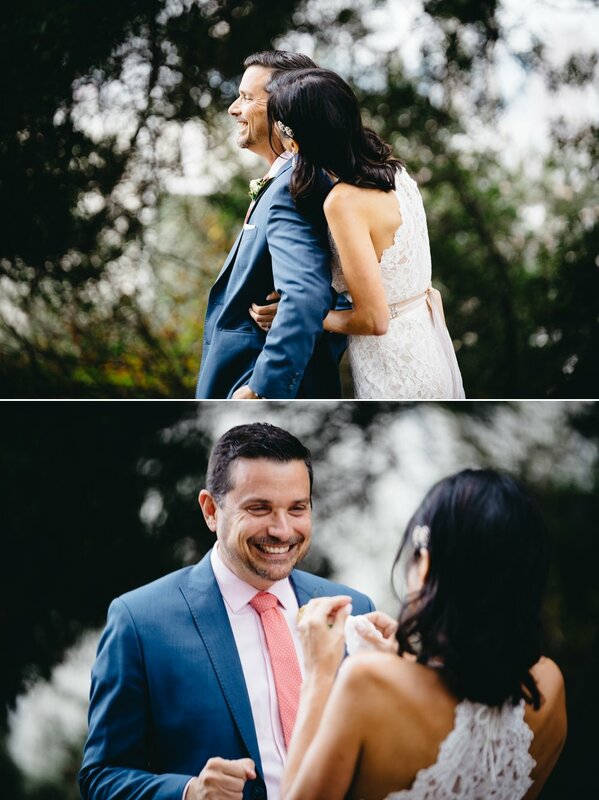 A first look is a moment when the bride and groom are all finished getting ready + have a moment to see each other for the first time before they head down the aisle. There is much debate about why you should or shouldn’t incorporate one into your day. I’ve shot weddings all around the world and seen couples chose to see each other or to keep it a big moment for the ceremony. Fresh as fresh can be. What a perfect opportunity to see each other once the makeup is perfected, the shoes and hair are in order, the tie is straighten and in check and the collar or all the lacy details are all in pristine condition. No running around to get from one place to another while hiding from guests + staying out of the hot sun on a summer day or having the wind whip your hair around. On your perfect mark, see your Sweetie, GO [get married]. It works. Perhaps one of the greatest reasons to consider a first look. Having a first look saves time. Once you have your few moments together for your first look you can jump right into your bridal party portraits + group pictures. Not just you are fresh, your crew is gleaming has well. No tear influenced makeup smears, no messy hair from walking down and back up the aisle. I even have some couples that opt to knock out family photos before the ceremony. Seeing each other in a first look frees up time to mingle + spend time with your guests during cocktail hour. Just like that. Let’s face it, a Wedding is a crazy, busy day. Some brides and grooms opt for a first look to simply share a few moments of intimate alone time with each other [and me the nosey photographer ;p]. This, after all, is YOUR day, meant for just the TWO of you. I’ve witnessed many of these and the emotions are truly the best and, sometimes, the highlight of the day. Having a first look is a way to bring you and your love together, right from the beginning of this crazy day. My couples get married at the coolest places, sometimes in a vineyard, in a historical landmark, an industrial warehouse, deep in the woods, next to fancy boats, in red country barns, at the bottoms of emerald mountains, you name it. Having a first look allows you to get a cool series of photos in a part of your location or venue that you may not get to utilize on the day otherwise. First looks only take 10-15 minutes, in that time not only does the big reveal happen but there is an opportunity to get a dozen or so more extra portraits of each other together. Some days, dependent on the chaotic schedule or locations it may be tricky to get portrait time as it is, this is a nice way to ensure you get some added portraits together.